First published in 1861 by Joshua Sylvester in A Garland of Christmas Carols, the lyrics to “The Holly and the Ivy” are centuries old. The symbols predate Christianity and were likely altered to represent the symbols of Jesus, Mary, and His blood, crown of thorns, and crucifixion. 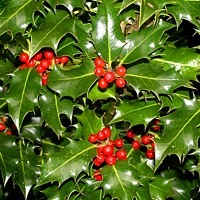 The adapted meaning of the holly and ivy are a little unclear, but they have symbolic origins in druidic and Roman rituals and mythology, and some have suggested the holly represents the masculine aspect of Jesus, and the ivy the feminine aspect.